Lose yourself in great stories as you play free Book Games adapted from famous books. Try before you buy! 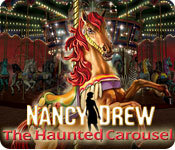 Investigate a series of mishaps at the Jersey Shore in Captain`s Cove Amusement Park as Miss Nancy Drew.